This lemon and thyme risotto, with its luxuriously creamy texture and lovely lilt of lemon, may seem as though it took all day to make. That couldn’t be further from the truth. Shhhhhh. No need to tell anyone else that. It can be our little secret. As author Richard Bertinet explains, there’s an idea that risotto is complicated because you need to stand over the pan and stir. True, it does require stirring, although the complicated part couldn’t be further from the truth. Although given the risotto’s luxuriously creamy texture and lovely lilt of lemon, it may seem as though it took all day. Shhhh. No need to tell anyone the contrary. Originally published Apr 9, 2012. 1. Chop the onion into small dice—you want the onion to disappear into the risotto, so don’t make the pieces too big. Place the egg yolks in a bowl. Grate the Parmesan. Zest the lemons and squeeze the juice. Reserve a few strips of lemon zest for the garnish. Pick the thyme leaves from their stalks, but leave a couple of sprigs whole for the garnish. Place your pan of stock onto the stove, bring to a boil, and then turn down to a simmer. 3. When the onion is soft, add the rice and stir very well to coat every grain. The pan will be getting quite hot and dry now, so add your white wine, sprinkling it in carefully around the pan—this evenly distributes the wine and helps it to reduce and evaporate more quickly. Add half of the lemon juice and half of the zest and cook for 1 minute. Keep stirring gently. You will hear the wine “singing” as some of it reduces in the pan. This will probably take about 2 minutes, and then the rice will look dry again. 4. Now you are ready to add your hot stock, a ladleful at a time. After every ladleful, stir well, really scraping the bottom of the pan, until the stock has almost disappeared into the rice. Then add another ladleful, keeping the rice moist all the time—don’t let it get dry in between ladlefuls. After about 15 minutes of adding stock and stirring in this way, start to taste—be careful, since the rice will be very hot. The rice needs to be tender, but still have some bite to it. Your risotto should take no more than 20 to 25 minutes from start to finish. 5. When you feel that it is almost there, take the pan off the heat. 6. Quickly mix the cheese, as much thyme as you please, and the remaining lemon juice and zest into your bowl of egg yolks, and then beat this into your risotto as energetically as you can. The risotto should be nice and relaxed and creamy. If it feels a bit too thick, whisk in a little more hot stock. (Rice retains a lot of heat, so you can relax and not rush to finish it off.) It should be creamy and slightly soupy, so if you think it’s too stodgy at the end, you can just add some more hot stock until you are happy with the consistency. Taste and season if you need to. However, remember that if you’re using store-bought stock, it may be very salty anyway, as is the Parmesan, so you may not need much salt. 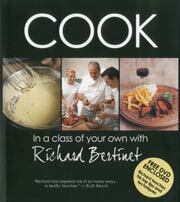 Lemon and Thyme Risotto Recipe © 2010 Richard Bertinet. Photo © 2010 Jonathan Gregson. All rights reserved. All recipes and photos used with permission of the publisher. I can’t find one thing I would change with this recipe. It’s very well written. I think even a novice risotto maker could follow these directions. It feels like the author is taking you by the hand and walking you through the steps of making this perfectly. I can’t complain about the end results, either, as my daughter and I agreed it tasted heavenly. We loved the brightness the lemon juice and zest gave, as well as the creamy texture that was helped along by the egg yolks (who’d a thunk it?) and Parmesan. Of course the onions, veggie stock, wine, butter, olive oil, and thyme led to some great flavor as well. We used Arborio rice, since that’s the only kind of risotto rice we can find here. I served it with a roasted turkey (wanted some leftovers for turkey pot pie later in the week and some turkey salad for my lunches at work), green beans, fries for the guys, cranberry sauce, and some biscuits. We’ll definitely be making this one again. I agree with the author that risotto is one of the easiest ways to prepare rice. But even if you disagree, you can be assured of success with this recipe, thanks to the very detailed, well-thought-out instructions. And you’ll be rewarded with a risotto that’s bright and fresh, yet rich at the same time. The thyme adds the perfect herbal compliment to the lemon. This recipe makes a pretty big batch — we got six servings out of it. It was wonderful as a platform for sauteed shrimp. In the future, I wouldn’t hesitate to swap out the vegetable stock for chicken stock, or even a seafood stock, depending upon what I was serving with it. Risotto — ah, what a wonderful thing to eat. We loved this Lemon and Thyme Risotto and couldn’t get enough of it. Don’t let the wordy recipe turn you off. Each step is a rite of passage to achieving creamy, lemony greatness. Surrender yourself to every precise instruction, keeping in mind that it is given for a good reason. The reward after the meditative pour-and-stir ritual is sublime. When prepared right, the ingredients flawlessly play their roles in harmony to create the most satisfying aroma, flavor, and texture. This is one of the very best risottos I have ever made. As with any risotto recipe, you have to be very patient, but is it so well worth it. The final result was creamy, a nice zesty taste from the lemon, and aromatic thanks to the thyme. A must repeat. One thing though is that I ended up having to use a cup more of stock than the recipe asked for. I loved the taste and texture of this risotto. I was a bit skeptical, as I’d never made one with egg yolks in it before. But this all works. The taste is very very lemony, so if you like lemon you will love this. I used 11/2 large lemons. I also was stingy with the thyme as “a bunch” is very interpretive and thyme has a pronounced flavor. I used about two tablespoons of the thyme leaves. I personally would reduce the lemon next time I make this, but my husband loved it as-is. This recipe makes a ton of risotto. I served it as a side dish — 6 servings worth — and there is still some left over. The leftovers reheated in the microwave quite nicely. My only beef with this recipe is the directions. There is so much superfluous writing that sometimes, as you are making the recipe, it’s actually hard to decipher what the instruction actually is. Trying to convince anyone that making risotto is easier than making plain rice? I don’t think so. If this book is targeting the inexperienced cook, it may actually scare them away because the recipe is easy but requires your constant attention. This recipe produced a great risotto. 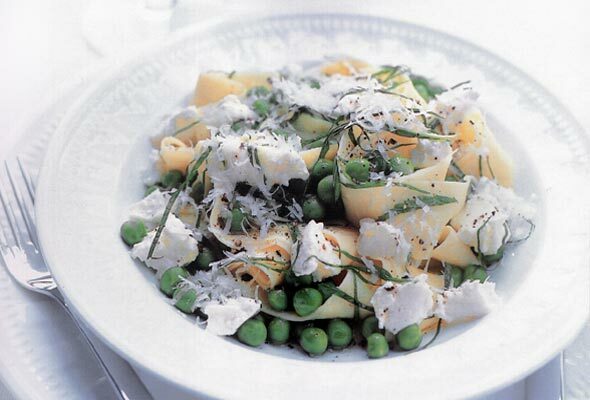 The lemon and Parmesan together made for a rich yet not overly heavy meal. I used about one cup Parmesan, about two cups Arborio rice, and about ¾ cup white wine. The resulting risotto had a bright, lemon flavor with a warm, creamy texture. It is a full flavor risotto with a touch of nuttiness. It is totally satisfying but not too rich. This risotto would be great served year-round. 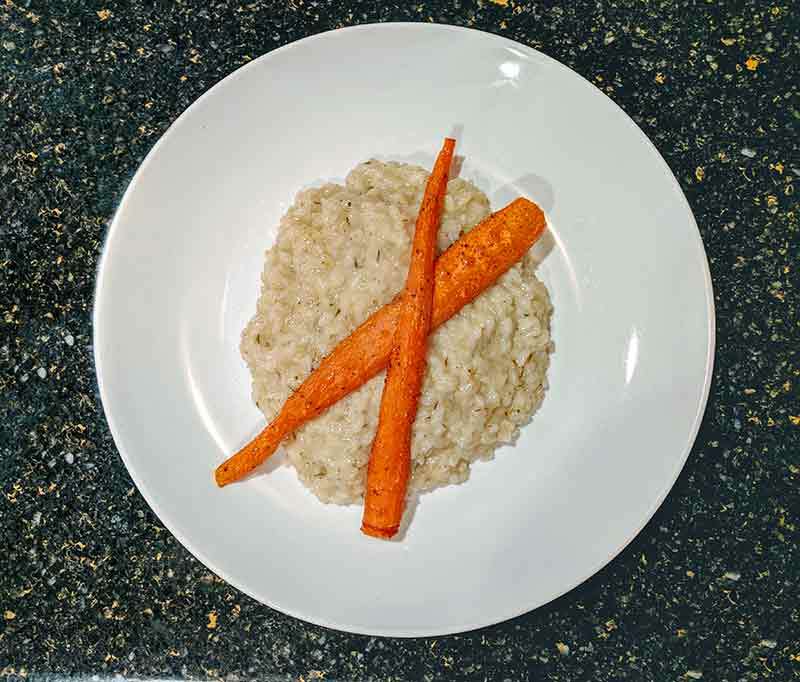 Love this risotto — so simple and satisfying. Anyone who loves lemon should make this, it has a nice tang balanced with the richness of the egg yolk and cheese. This was absolutely delicious. It’s a great method for making risotto, quite different from the way I’ve been making it for years. It’s worth reading the recipe well, just to get some tips. The finished product was lovely, creamy, and very fresh tasting. Thinking about the lemon, Parm, and springtime made me think about asparagus. I oven-roasted a bunch of asparagus, sliced them diagonally, and put them on the top of the risotto. It looked beautiful and tasted even better. Happy to say that there are enough leftovers for a delightful meal tonight. We even have some of the Chenin Blanc left that matched so well with the risotto. Yum! A soulful recipe for the weekend! Praj, what a beautiful and apt way to describe this recipe! Well, dear old dog, you’ve made this old dog quite happy. Renee and Beth Price, our director of recipe testing, work extremely hard on finding the best, most tasty, and clearest recipes out there. Then each dish undergoes intense testing by our recipe testers. And all for one reason and one reason only: For you to have the experience you had last night. Thank you for letting us into your kitchen. Judy, we are so pleased that we were able to help with those new tricks! Wow, this was a wonderful and simple dish. I added some grilled asparagus as a garnish and served with salmon. Can’t wait for leftovers at work tomorrow! What a divine looking risotto! I’ve never heard of finishing a risotto with egg yolks, but it does make sense. I can’t wait to try this as risotto is one of my favorite dishes. Absolutely delicious! Pure, understated flavors that transport me to Italy. I have never been able to replicate this type of meal at home … until now. Thank you! Zoe, lovelier words have never been spoken! So glad to hear that you enjoyed your “trip” to Italy. I will definitely make this! Risotto is my comfort food and lemon and thyme a favorite combination. Kristi, do let me know what you think! Yum, I thought I’d like it and I did! Had to use some dried thyme as I discovered I was out of fresh just as I began cooking. Added it at the beginning of the cooking process instead of the end. Loved the lemony kick and I dare say this replaces sun-dried tomato risotto as my most favorite version. My 12-year-old daughter loved it as well and roasted some carrots to go along with the dish. Very satisfying dinner on a chilly night!